Both bands are built around a duo and the ever-present interplay between musical counterparts. In Mates of State, it's husband-wife duo Jason Hammel and Kori Gardner, while Generationals offer Grant Widmer and Ted Joyner, a songwriting duo with a friendship that dates back to their early high school days. 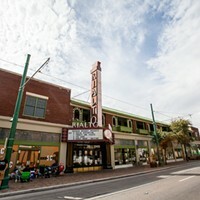 The Generationals, from New Orleans, have developed a strong Tucson audience through frequent touring and a connection through Park the Van Records to Golden Boots. The band's throwback pop has grown a bit spacier and fuller as a five-piece. Opening with "Nobody Could Change Your Mind," the band raced through a set that mixed standouts from 2009 debut Con Law, 2010 EP Trust and this year's Actor-Caster. Highlights included Motown-influenced "When They Fight, They Fight," the lively "You Say It Too" and the bouncy set-closer "Trust." However, the appreciative Plush crowd clearly turned out for Mates of State, whose nearly 20-song set touched on midcareer favorites like "Get Better" and "The Re-Arranger" (from 2008's Re-Arrange Us), and "For the Actor" (2006's Bring It Back), before moving into more songs from this year's Mountaintops. Covers of Jackson Browne's "These Days" and Daniel Johnston's "True Love Will Find You in the End" were both re-envisioned in Mates of State's poppy and adorable style. The band's final encore was "Palomino," the first song on Mountaintops and one of the year's best singles, a burst of exuberance that had the still-packed house jumping and fist-pumping. The ultimate—and simplest—test by which to rate a live performance is to ask: Did you go into a show liking the band, and come out liking the band more? Both Mates of State and Generationals soared past that mark.